June 11, 2006 Lakeshore Baptist Church celebrates ninety-five years of ministry in Lakeshore MS. The church invites the community to its 11:00 service that Sunday to be followed by dinner on the grounds and a concert. 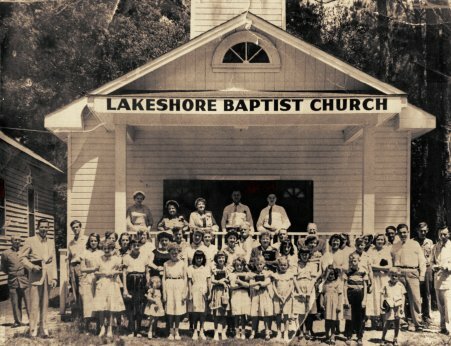 In 1911 a small band of believers gathered in the home of R. C. Crysell to establish the Lakeshore Baptist Church. Four years later a major hurricane slammed into the Gulf coast taking their first building. Undaunted, the congregation rebuilt and continued proclaiming hope in a God who remains in control. In 1968 Camille took that building but left a 1952 structure to be cleaned out and used for services. On August 29, 2005 another storm, more powerful than any the gulf coast had ever seen, destroyed all buildings owned by the church. With faith in an unshakeable God, Lakeshore Baptist Church continues to minister to her community and offer hope in Jesus Christ. Lakeshore Baptist Church invites the community to join her in celebrating ninety-five years of perseverance and prayer. The 11:00 Sunday morning service will highlight God’s unfailing hand of providence. Sixth Street Baptist Church of Alex City Alabama will supply a full lunch immediately following the service. Local gospel group, The Morans will appear in concert at 2:00. Lakeshore Baptist Church is located at 6028 Lakeshore Road. Don, it’s wonderful that even though your church buildings have been destroyed by earthly storms, the church itself has not been destroyed!